if we haven’t yet done the marketing equivalent of running up and slapping you in the face, then please allow us to introduce ourselves. Paddy Power is Ireland’s biggest, most successful, security conscious and innovative bookmaker. We operate via www.paddypower.com, our chain of retail outlets throughout Ireland, Northern Ireland and Great Britain, our Dial-A-Bet department and more recently our Mobile division. Whether you like the buzz and the human interaction of the betting shop or you’re deeply agoraphobic and have grave misgivings about the outside world, in one form or another Paddy Power is there 24 hours a day with a customer service team to match. Paddy Power Shop FrontAnd here’s a quick run-through of the boring stuff. Paddy Power was founded in 1988 by the merger of three existing Irish bookmakers. From the outset the company took an unconventional approach to betting and adopted a commitment to offer greater value and fairness to customers who had for too long suffered from the whims and self-interest of a staid oligopoly. The meteoric rise of the company then and the continued strong growth of more recent years indicate it’s a formula that the customer appreciates. As at February 2010, Paddy Power operated a total of 356 retail outlets (209 in Ireland, 8 in Northern Ireland and 139 in Great Britain. Almost two thirds of Paddy Power’s profits were generated outside of Ireland in 2010. We are the third largest online bookmaker and sixth largest online gaming business in Britain and Ireland and, at the current trajectory, we will have more shops in the UK than Ireland by 2013. The acquisition and growth of Sportsbet and IAS made us the number 1 online corporate bookmaker in Australia. New B2B activities have seen us expand into France, in partnership with PMU. A full year’s contribution from our Australian acquisitions is reflected in the results bringing greater visibility to the scale of the Group’s online business. In 2010, turnover was over €3.83 billion, up 39% on 2009. Underlying operating profit was €103.8 million, an increase of 48% on 2009. The Group’s total profit after tax was €97m. 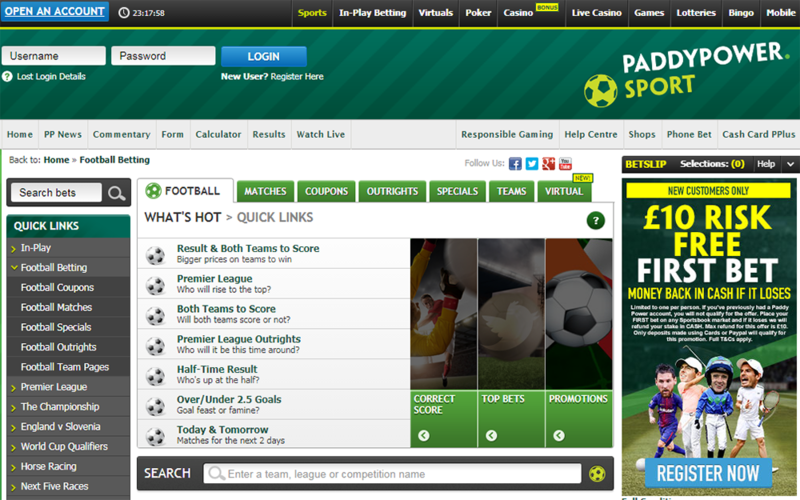 For further information on Paddy Power PLC, please check out www.paddypowerplc.com. The pioneering spirit of the early days has remained constant over the years. The Money-Back Special was one early initiative designed to give customers a better betting experience and in the sincerest form of flattery, it has been ‘borrowed’ and poorly replicated by many of our competitors. For the Champions League final of 2011, we took the concept to new territory by asking customers to choose what Money-Back Special they wanted to apply for the Wembley showpiece. Knowledgeable as ever, the customers overwhelmingly and shrewdly opted for the ‘Barcelona to win in 90 minutes’ option, a decision that looked like paying off long before the final whistle was blown. It meant we gave back over €3,000,000 to customers who bet on the match and Paddy had to cancel his holidays for the next five years. Aside from our Money-Back Specials, we’ve also become known for our Justice Payouts. We refunded bets on Ireland to beat Wales in the 6 Nations after the match officials ignored the rulebook. At the turn of the millennium — when we assumed the internet was something fishermen attached to a trawler — we decided to get ourselves one of these new-fangled ‘websites’. We haven’t looked back. Alongside the startling growth of www.paddypower.com, we’ve also launched poker, www.paddypowerpoker.com, casino www.paddypowercasino.com, live casino live.paddypowercasino.com, bingo www.paddypowerbingo.com and games www.paddypowergames.com channels. We were also in the driving seat when the smart phone revolution rolled around. In May 2010, we launched our iPhone App and for some time we were the only bookmaker in the world in the Apple App Store. There soon followed apps for the iPad and Android phones and since then mobile betting has become one of the biggest growth areas in the company and a substantial contributor to overall stakes. The developments haven’t stopped there and just in time for Royal Ascot 2011, we launched streaming on our mobile apps. Now you can watch any race being streamed by At the Races for £/€1 provided you’re not in the back end of nowhere and have a decent signal. The Paddy Power commitment to innovation is mainly aimed at providing punters with more platforms, events and markets to bet on and ensuring that customers always get a fair deal and run for their money. It speaks volumes about our strategy that we’re now on first name terms with the doorman at the Advertising Standards Authority. Our tongue in cheek approach to marketing isn’t to everyone’s liking however. We ruffled a few feathers when we erected the world’s biggest ‘Hollywood’ style sign at the Cheltenham Festival, then the Ryder Cup at Celtic Manor and in-between found time to come up with the most complained about ad of 2010. We thought our tribute to the skills of blind footballers was amusing, but lots of people disagreed. The important thing is Felix has made a full recovery. We’ve been featured by such esteemed organisations as CNN, The New York Times and the BBC for our ground-breaking marketing enterprise.